Spring is fiddlehead season in many northern areas. Fiddleheads are young ferns that are in the process of unfurling. Coiled fiddleheads resemble the end of a fiddle, and so they are called fiddleheads. The coiling part of a fiddlehead is called a crosier. Perhaps you are lucky enough to have fiddleheads growing in your own yard for feasting. If not, you may want to join the throng of other people who enjoy the hunt for fiddleheads in the spring. Pick young fiddleheads early in the day while they are at their freshest. Choose fiddleheads with tightly coiled crosiers and with only approximately 1 inch of stem extending from the crosier. 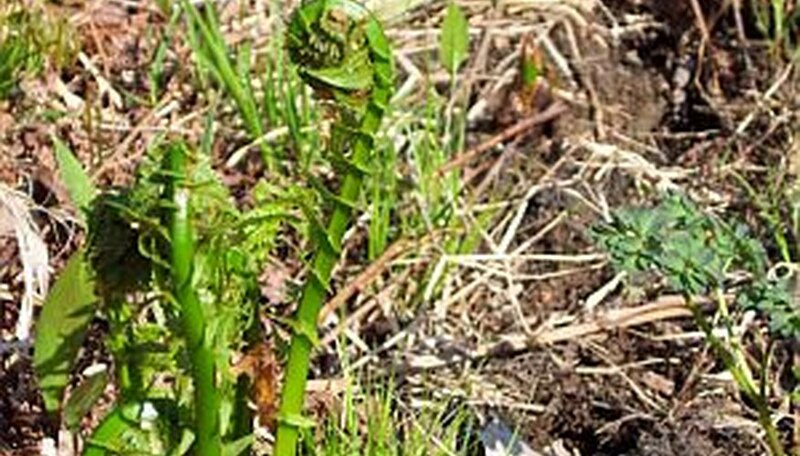 A fresh fiddlehead will snap off easily when bent. Examine the fiddleheads for brown chaff on the surfaces. Gently rub as much chaff from the fiddleheads with your bare hands. Grasp the fiddleheads by the ends of the stems and shake them carefully outside to loosen and remove the chaff. Place the fiddleheads in a bowl filled with water and swish the fiddleheads around in the water to remove any remaining chaff. Pour off the cold water and dirt and repeat the soaking and swishing process at least two more times. Place the fiddleheads in a colander and run cold water over them for a final rinse before preparing them to eat. Shake off as much excess water as possible.